In the video below, I address a commonly asked question about why individuals should work towards challenging goals that may not initially seem possible. The triple under is discussed as an example. First off great video and I like that imagery of people putting ceilings to block their potential. I have done it a lot of times and it is something I am working on to stop. I have spoken to you before and I love the website as it makes my workouts so different from everyone else at the gym, so much so I get people asking lots of questions and some are like the ones you have ranted about and others are more positive. But my point is I am glad and I hope you are that you get these types of negative emails as it shows that you are demonstrating the right exercises and the ones that are out of peoples comfort zones, ones that really work not only body but more the mental strength too. Keep up the great work and continue to be inspiring! What was the point of breaking the 4-minute mile barrier? What is the point of swimming 2.4 miles, biking 112 miles, and finishing it all off with running a marathon? I couldn’t imagine training without any short term or long term goals, even if at my age, my goals are more about maintaining my current fitness for as long as possible, instead of improvement on my current condition. People are always asking me why I even bother to work out since it’s not like I’m competing in a sport, and I’m a middle aged man of 50, so my priorities aren’t in the right order. I just ignore the negative feedback and will continue to train as I’ve been doing now for the last 36 years. Ross you are an absolute legend. I love how you don’t take an offensive stance towards people and attempt to educate them, I’ve only recently managed to get the double under perfect and still struggling to knock them out. The brilliance is its so simple, yet so hard. Great, great post! That sentence of B. Lee should be hanging in every gym. Not only gyk but every home or office. Ross keep up the good work. I come to your blog for inspiration almost on a daily basis. I see what you do and what you post others doing and it inspires me to train harder and work beyond what I thought I was capable of. Excellent response to the negative feedback. Its only from checking your blog that i’ve realized how benificial the jump rope is. 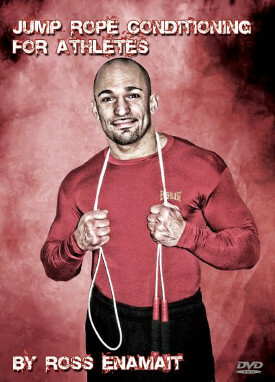 I went out the other day and bought a speed rope so i could improve and more effectively get a solid workout from it. Those who say “what’s the point” I always think that they really don’t have the drive for real success. They are satisfied with their minimal gains in the gym. It’s fear really, fear of the unknown and fear of their own potential. I have clients that when we begin they can’t even imagine doing 100 consecutive burpees, they tell me I’m out of my mind and they could never do that. 2 months later they have completed their first set of 100 and are absolutely astounded at themselves. After that there is no more questioning their own limits in the gym! I WILL be doing the triple unders and looking for more after that! Excited to recieve your rope dvd in the next day or so. Keep up the awesome work Ross and thanks for being out there pushing the limits. Great quote. I find this sort of thing so motivational. Just the thing to watch on those days when self doubt creeps in. The woman is 86 years old! HI ROSS, ANOTHER GREAT RANT. THE NAME OF THE GAME IS PROGRESSION. I AM 61 AND EVERY YEAR I GIVE MYSELF GOALS TO ACHIEVE IN THAT YEAR. I BELIEVE I WILL BE ABLE TO DO THIS FOR MANY YEARS. EVEN IF I DO NOT ACHIEVE A GOAL AT LEAST I HAVE IMPROVED UPON THE STARTING PLACE. THE LATE, GREAT JACK LALLANE SHOULD BE AN EXAMPLE TO US ALL. IF YOU HAVE ALWAYS WORKED OUT AND STRIVEN TO IMPROVE YOU CAN BE DOING EXTRAORDINARY THINGS ALL OF YOU LIFE.IS THAT NOT WORTH THE EXTRA EFFORT? KEEP UP THE GREAT WORK YOU DO TO INSPIRE AND MOTIVATE. Is there not something eery about a man who died prematurely saying “if it kills you, it kills you.” He must have really meant it. Dear Ross, after recently being tempted to a more moderate game plan,goals etc, ie 43 years of age, you have just cofirmed to me the restinraint i have been feeling towards this course was correct, and i have been motivated to rededicate to my past goals. Thankyou very much for your encouragment yours sincerely Richard. If you really love fitness there is no “why”. You’ll simply be doing it. Way late in seeing this video but great thoughts. Always pushing forward and setting new, more challenging goals.